Hello, we are planning a roundtrip on Crete from 25 May to 7 June. 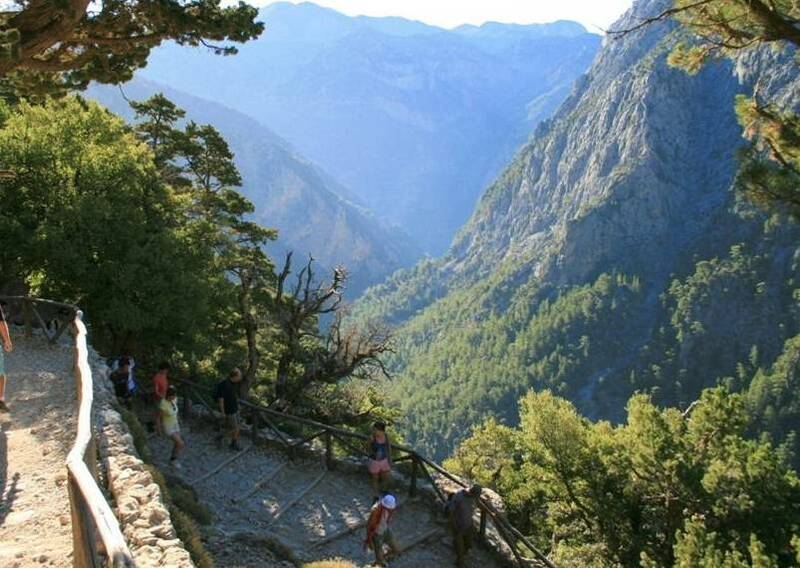 On this trip we also want to walk the Samaria Gorge. So we are thinking of taking a room in Paleochora and take a bus to Omalos to walk the gorge. To make the hotel reservation we need to know if there is a daily bus from Paleochora to Omalos. Does it run on 1 June, or how we can handle the trip? We have a rental car but the beginning of the trip is Omalos and the end is Paleochora, so this is not possible to do by car. Yes, you can take the local bus from Paleochora to the northern end of Samaria Gorge which leaves each morning at 6.15 am. The Samaria National Park is open from May to October every year so that the bus will depart during these times. However to be sure, it would be best to check the timetable with KTEL, the local bus company, or email or phone them to be sure that this bus will leave on the date you require. Then again check with your hotel when you arrive in Paleochora, to be sure. Timetables are seasonal, so you must always check. You can then take the 16 km walk from north to south which starts at Omalos and ends at the village of Agia Roumeli on the south coast. Then you can take a ferry back to Paleochora. There is another option on how to do this walk – which may mean you cannot do the whole 16 km track, but you will still experience the south of Crete, and walk 16 km if you choose. The idea is to take the ferry from Paleochora to Agia Roumeli in the morning, walk the gorge from south to north for part of the way, then return to Agia Roumeli before the evening ferry to Paleochora. Or you could stay overnight in Agia Roumeli which is a nice calm place after all the day walkers have left on the last ferry. 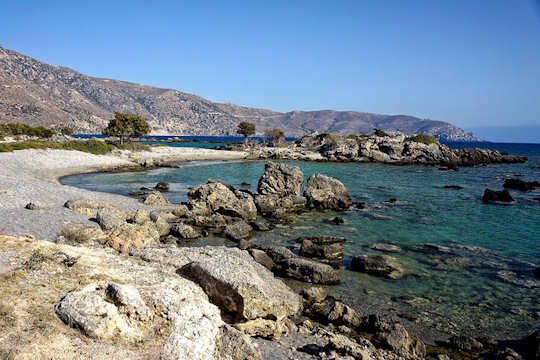 Be sure to check the ferry schedules with Anendyk SA - the company that runs the ferries along the south coast of Crete, or check with your hotel in Paleochora. Paleochora is a sizeable village with all ranges of accommodation from budget to villas for a week-long holiday for a large family. See our accommodation suggestions below. 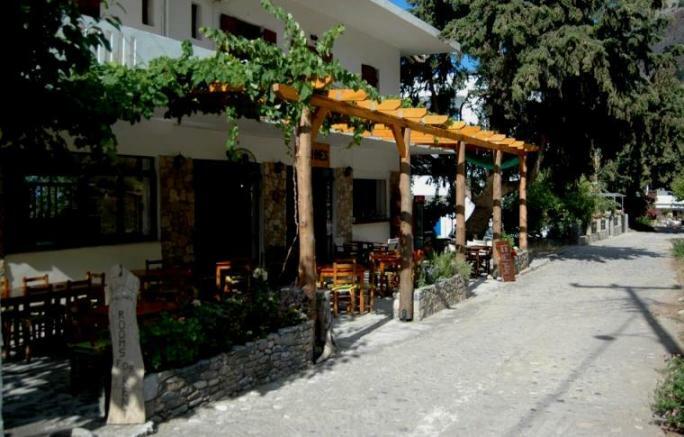 In Paleochora we suggest the Aris Hotel run by a local family, very central, close to everything and easy for enjoying the cafes and restaurants of Paleochora. Close to the Selino Kasteli historic site. As you will have a car, the more secluded Olive Tree Cottages a very relaxing place to stay, just 2 km out of town. Away from any crowds, yet a 20 minute stroll into town and along the esplanade. Enjoy the many beaches nearby or hikes such as Anidri Gorge. Agia Roumeli is a small, remote seaside village that has grown a little because it is situated at the end of the Samaria Gorge walk. Or at the beginning, depending on your point of view. There are quite a few small hotels, no over-sized sprawling resorts and no villas. See our suggestions below for budget and mid-range accommodation. We suggest that you book well ahead as the walk is one of the most popular activities on the island. 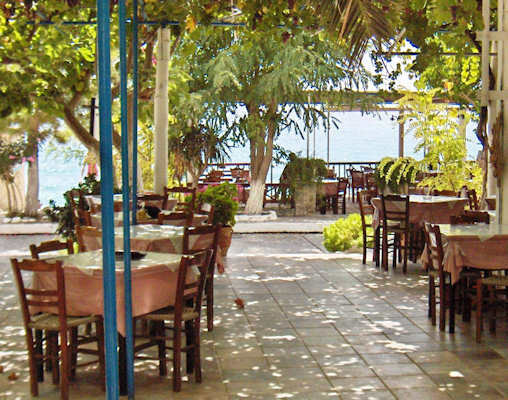 In Agia Roumeli we suggest the Gigilos Hotel with its own taverna overlooking the beach. Pachnes B&B is a lovely place just a little bit back from the main beach at Agia Roumeli, quiet and small. Get away from it all here, to rest after your long walk. Another alternative is to take the bus to Omalos Plateau the day before you want to hike, and stay on the plateau, so as to get a good early start before the heat and the coaches arrive. 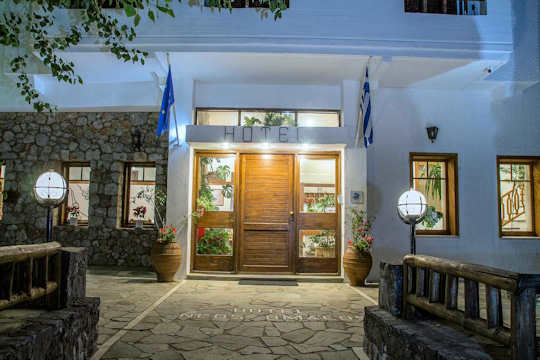 The Neos Omalos Hotel welcomes hikers of Samaria Gorge and has a shuttle bus service to the start of the walk, provided at no cost. Learn great local knowledge from your friendly host. Great taverna food and fresh orange juice at breakfast. Bus from Paleochora to Omalos - the information pages you might need are below. Getting to Paleochora - take a 1 hour flight from Athens to Chania with Aegean Airlines or Olympic Air, with many flights available per day. Or take a 9.5 hour overnight ferry from Pireaus port of Athens to Souda port of Chania. If you arrive into the airport or port of Chania, it is a journey of around 90 km to Paleochora. Drive west on the national road for about 20 km until Tavronitis where you take the road south with signs to Palaiochora Παλαιόχωρα, then it is a further 70 km south. Getting here by flights, ferries and hire car below.